Dubai is a city of contrasts, and perhaps no other options will be better than opting for Big Bus Tour to explore both sides of the city. From the historic Al Fahidi Fort with Dubai Museum and traditional gold and spice souks to stunning beaches and modern skyscrapers, our city tour in open-top double decker bus for family will provide a comprehensive intro to the city’s major highlights. You can opt for sitting on top and delight in open air view or travel inside our air-conditioned cabin while hip-on or hip-off as frequent as you wish to enjoy the finest dining, shopping and entertainment activities with near and dear ones at major tourist spots in Dubai. With our recorded commentary that is available in eight different languages, the tour will deliver interesting info on such aspects of the city as its heritage, cultural history and rapid advancement, the little ones would delighted to know. Depending upon your timing, unique requirements, you can choose from our 24-hour or 48-hour family tickets.Most of all, the ticket comes with an assortment of free inclusions, such as dhow cruising on Dubai Creek, entry to Dubai Museum, visit to Sheikh Saeed Al Maktoum’s residence and walking tours, in addition to a number of discounts making it a perfect family holiday. The Big Bus ticket includes three routes the City Tour, Beach Tour and the Marina Tour. Package with 3 routes, 40 Stops & 12 Languages to choose from. Inclusions of your trip vary as per ticket type selected, for details please view important information above. Discover the best of Dubai with the Big Bus Night Ticket. 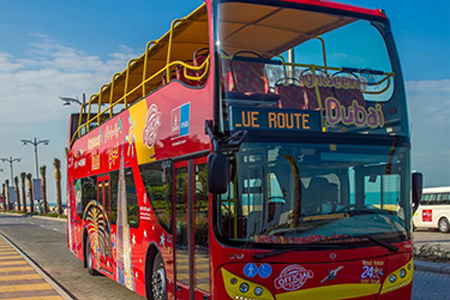 Discover the best of Dubai with the Big Bus Classic Ticket. Discover the best of Dubai with the Big Bus Premium Ticket. Discover the best of Dubai with the Deluxe Ticket. Great coordination by the team. It was my first visit to Dubai and Rayna tours did not make me feel that. Kudos to the team!! I chose premium big bus tickets for my family and to my surprise it was the best activity I chose till now. Dubai is definitely a beautiful place. I booked this tour for my girlfriend on her birthday last month All thanks to Rayna tours for suggesting the Big Bus tour. She loved it so much. If you want to experience Dubai to the fullest, Rayna tours Big Bus tour is the best you can choose. It was great. My husband booked this tour for our family last month. It was the best experience of my life.